We are a small, family run business and therefore can offer you comfort and exclusivity at competitive prices- especially during the low season. We have two spacious apartments, both of a 3 star rating and each with a maximum capacity of 6 beds. Apartment Rajka on the first floor boasts a beautiful sea view from the balcony. It has a separate kitchen, bathroom and main bedroom with a double bed plus a sofa bed and a second bedroom with twin beds. Apartment Dana on the ground floor also has a bathroom and bedroom with twin beds. The kitchen and living area are joined onto the main room with the double bed and sofa bed. This apartment has a luxuriously spacious patio to spend the balmy summer evenings on. The accommodation we offer is within walking distance to both the sea and to the village centre. However, we recommend that you hire a car (or bicycle) to explore the more remote beaches. There is private parking available next to the apartments. All this serenity and yet you are only 12 km away from Pula, the beautiful historic city where you can discover relics from ancient Rome, including a stunningly preserved amphitheatre where summer concerts are often held. Be sure also to try the local culinary delights from local wine and olive oil to the signature ingredient of the region: truffles. There is also nightlife to be enjoyed, including restaurants, cocktail bars and the club Joy in the village. You may also wish to explore near-by Medulin, Rovinj, Umag or Pula for a wider range of bars, clubs, pubs, casinos, cinemas and more. A mere 15 km from the international airport of Pula brings you to the breathtakingly beautiful village of Premantura. 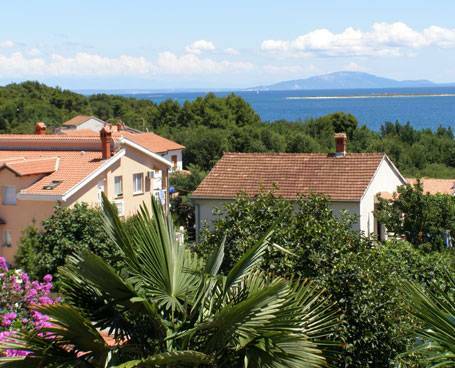 Located at the tip of the Istrian peninsula and surrounded by kilometres of beaches and beautiful Adriatic Sea, this offers the perfect get away. With so many beaches to choose from you will be spoilt for choice, but we are certain you will find idyllic calm in your own private corner.